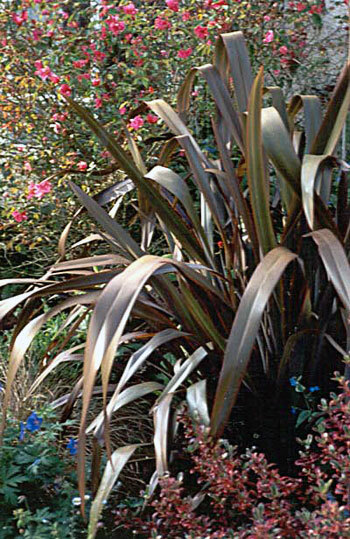 In the small garden between the decking and the house I've planted a big dark bronze Phormium (flax) with a Mutabilis rose climbing up the house wall behind. The various pots which sit in front are changed according to the seasons. In this archive photograph there's a variegated red Coprosma in one of the pots. Since this photograph was taken the flax suffered a couple of severe flattenings by snow. Then in summer it would perk up again, its flowers reaching to the upstairs balcony, so I'd allow it to stay for another year. 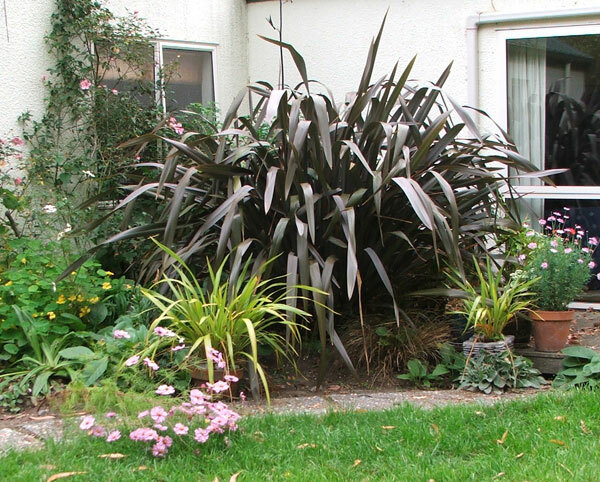 Phormium Tenax flaxes are upright - they look pretty silly with a droop! The Mutabilis rose suffered in that storm, too, and virtually has had to start again. That's no trouble for this tough old-fashioned rose.